Our gut has a tendency to let us know when something isn't right, and it's wise to listen. 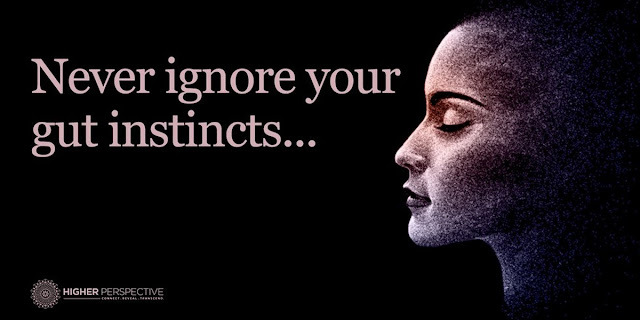 Your intuition calls upon every life lesson you've ever had in this life and helps you make an informed decision. If something doesn't seem safe, if you feel like it could become dangerous, don't do it. You'll experience this a lot in your life. You'll get this feeling on a date, buying a car, buying a house, working at a new job. No doubt about it. If it feels right, stick with you! Listen to your gut. "I'm a natural at this!" I remember the first time I ever picked up a paintbrush. I was 10 and in an art class. Immediately my teacher and I both recognized I had a knack for it. I was a born artist! A real natural. One of my greatest regrets is not going to art school. It's a gut instinct I didn't follow. Learn from my mistake. "I need to stop and help this person..."
There might be a time when you see a person in need and, even though it won't do anything to serve you, you just know they need help. Maybe it's someone struggling with homework or who just got into a car accident. Don't hesitate to stop and help if your gut is telling you to. If you're feeling drained, depressed, tired, and sickly, don't ignore it. Your body has ways of telling you when you're not well and need to visit a doctor. If your instincts say go to the doctor, you'd better go.